The 'Save our Hospitals' public protest will gather in both Acton and Southall before marching to Ealing Common where a major rally will take place Saturday 27th April.
" Ealing's Labour Council has sent an appeal to the Secretary of State saying we’re not happy. Jeremy Hunt, can put an end to this. We need to show him the public of West London do care about their hospital, do care about health service, and, if we turn up in large numbers, he will listen. "If Ealing Hospital is closed, a community that has difficulty with language, difficulty with transport will be affected. From Southall to Northwick Park, which is the nearest hospital, is one hour forty-five minutes one way. "Now is the time to react. Once you start the process of closure, it’s very difficult to reverse it. As soon the decision is made, staff will start leaving, nurses will start losing confidence, and patients will start losing confidence." “There’s no point saying maybe Labour will come and reverse it in 2015, we need to have something to be saved. If we don’t get Labour back in 2015, the NHS will be unrecognisable. If we leave it until 2020, there’ll be nothing left to save." 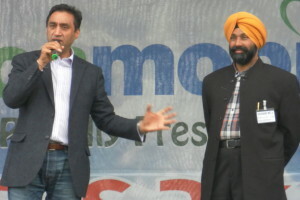 Labour's views were echoed by GMB, the general trade union affiliated with the party, who were out talking to the community members at the Vaisakhi Mela. “Very clearly, Ealing hospital is Ealing’s hospital and Southall’s hospital —the hospital of the third most diverse borough in Britain. We have a big problem with TB in Southall and huge problem with the language barrier – especially for the elderly. Yesterday’s GDP results came out confirming a narrow triple-dip miss for the economy, yet the figures showed a substantial decline in construction, with growth down by 2.5% in three months. Considering the plans to level the hospital to build new houses, would this not help the economy? “There will be 7000 potential job losses on the NHS, plus the 2 million people without an A&E. Yes, GDP and construction is down. To my mind, it’s a social housing problem. Hammersmith is a fine example – there has been bulldozing in areas like Earls Court and Shepherd's Bush, but this is not for social housing. From the community spirit shown last Sunday in Hounslow, there's another call to the community for support. The march from Southall will meet at Southall Park at 11.30am, while the march from Acton will meet at Acton Park at 12.30pm. 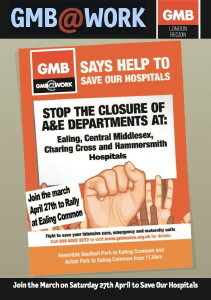 The rally will then begin at Ealing Common at 2pm. Social media fans can use #gmbsoh to tweet during the event, and participants can follow Dean Gilligan on @deangilli6 for the latest information.